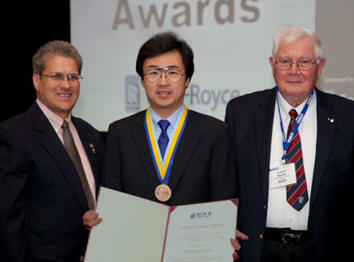 September 19, 2012 - HondaJet Designer, Michimasa Fujino, was presented the 2012 American Institute of Aeronautics and Astronautics (AIAA) Aircraft Design Award. Fujino is president and CEO of Honda Aircraft Company, Greensboro, N.C., which produces and sells the HondaJet, an advanced light jet aircraft that delivers class-leading performance, fuel efficiency, comfort and quality. The AIAA Aircraft Design Award is considered the most prestigious recognition for aircraft designers in the world. Fujino received the award on September 18 at a luncheon held as part of the 12th AIAA Aviation Technology, Integration and Operations (ATIO) Conference and the 14th AIAA/ISSMO Multidisciplinary Analysis and Optimization Conference, running Sept. 17 – 19 at the Hyatt Regency, Indianapolis, Ind. The AIAA Aircraft Design Award honors a design engineer or team for the conception, definition or development of an original concept, or career contributions leading to significant advancement in aircraft design or design technology. Past recipients of the award include Joseph Sutter for the Boeing 747, Harry Hillaker for the F-16, Burt Rutan for the Voyager, and Leland Nicolai for AGM-129/ACM. With 35,000 members, AIAA is the world’s largest technical society devoted to the progress of engineering and science in aviation, space and defense. During development of the HondaJet, Fujino published several technical papers on theoretical design methods and experimental results to prove this unique design concept. He also contributed to AIAA by presenting several lectures on aircraft design and development at universities and industry conferences. Optimum OTWEM configuration reduces wave drag on the wings, while increasing the wing’s drag divergence Mach number, thus increasing the aircraft’s performance and fuel efficiency. Also, by eliminating the engine support structure from the fuselage, it is possible to maximize cabin and luggage space without increasing the size of the aircraft. By employing this unique technology, the HondaJet offers the best performance and comfort in its class.